905 Loma Vista Drive, Beverly Hills, California, U.S.
46,000 sq ft (4,300 m2). Greystone Mansion, also known as the Doheny Mansion, is a Tudor Revival mansion on a landscaped estate with distinctive formal English gardens, located in Beverly Hills, California, United States. Architect Gordon Kaufmann designed the residence and ancillary structures, and construction was completed in 1928. The estate was a gift from oil tycoon Edward L. Doheny to his son, Edward "Ned" Doheny, Jr., and his family. Following the purchase of the estate by the city of Beverly Hills in 1965, the property became a city park in 1971 and was subsequently added to the National Register of Historic Places in 1976 as Doheny Estate/Greystone. The house and grounds are often used in filmmaking and television production. The house's descending staircase is one of the most famous sets in Hollywood. The 55-room, Tudor-style former residence, 46,000 sq ft (4,300 m2), is situated on 16 acres (6.5 ha) of land. At the time it was built, it cost over $4 million and was the most expensive home built in California up to that time. On February 16, 1929, four months after Ned Doheny, his wife Lucy and their five children moved into Greystone, Ned died in a guest bedroom in a murder-suicide with his secretary, Hugh Plunket. The official story indicated Plunket murdered Ned either because of a "nervous disorder" or inflamed with anger over not receiving a raise. Others point out that Ned's gun was the murder weapon and that Ned was not buried in Los Angeles' Calvary Cemetery, a Catholic cemetery, with the rest of his family, indicating that he had committed suicide. Both men are buried at Forest Lawn Memorial Park, Glendale, within a few hundred yards of each other. Both were involved in the trial of Ned's father in the Teapot Dome scandal. Ned's widow, Lucy, remarried and lived in the house until 1955, whereupon she sold the grounds to Paul Trousdale, who developed it into Trousdale Estates, and the mansion to Chicago industrialist Henry Crown, who rented the estate to film studios. In 1963, Crown planned to subdivide the property and demolish the mansion. Beverly Hills stopped the demolition by purchasing the mansion in 1965. The estate became a city park on September 16, 1971, and on April 23, 1976 it was added to the National Register of Historic Places. The city leased the mansion to the American Film Institute, from 1965 to 1982, for $1 per year, hoping to get repair and upkeep work from the institute. 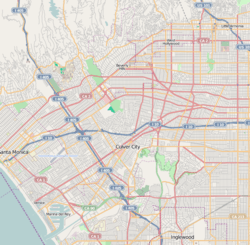 Since 2002 The City of Beverly Hills has maintained a Web page for the Greystone Mansion park. In addition to the city's restoration efforts, many local volunteers have been contributing to fundraising and restoration of the park, most notably the Friends of Greystone, who organize various showcase and garden events annually. Landscape alleé in the terraced gardens of Greystone. 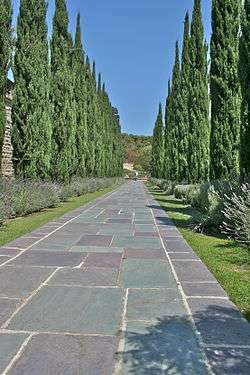 In addition to the numerous events that take place at Greystone, the mansion plays host each year to Catskills West, a theater arts and drama camp run by Beverly Hills Parks and Recreation, from mid June to early August. The camp presents a play in the pool area twice during the summer. The mansion is also used for performances of the play The Manor written by Kathrine Bates, directed by Beverly Olevin and produced by Theatre 40 of Beverly Hills. The Manor takes place in a number of different rooms of the mansion. The audience is separated at certain times during the play to watch some scenes in a different order. The plot of the The Manor is a fictionalized account of the Doheny family, involving Doheny's involvement in the Teapot Dome scandal and his son's murder. The Manor has been performed every year at Greystone Mansion since 2002; it opens again in January, and 2016 marks a run of 14 consecutive years, making it one of Los Angeles' longest-running plays. Greystone Mansion is also the location of "The Annual Hollywood Ball", where hundreds of celebrities gather each year for a grand fashion show, dinner and auction to raise money for the Pure Foundation, helping children in need around the globe. The million-dollar gathering also includes live performances by leading artists. Since 2010, an annual Concours d'Elegance car show has been held at the Greystone Mansion. 1 2 3 Timme, Katherine. "The History of Greystone". Retrieved 2007-12-27. 1 2 3 4 5 Hobart, Christy (2007-12-27). "At Greystone, there will be 'Blood' -- and bowling". Los Angeles Times. pp. F1, F4. ↑ Osborne, Donald (February 2012). "2011 Greystone Concours d'Elegance". Sports Car Market. 24 (2): 44. ↑ Sanderson, Peter (2007). The Marvel Comics Guide to New York City. New York City: Pocket Books. pp. 62–63. ISBN 1-4165-3141-6.